Tempe, AZ – A large crowd showed up at Wells Fargo Arena on Saturday, but the ASU basketball team did not. To be more specific, the effort and energy was there, but the Sun Devils had a difficult time putting the ball in the basket. As a result, Arizona State (18-6 / 7-4 Pac-12) lost to the Stanford Cardinal (15-9 / 6-5 Pac-12) in Tempe, 62-59. 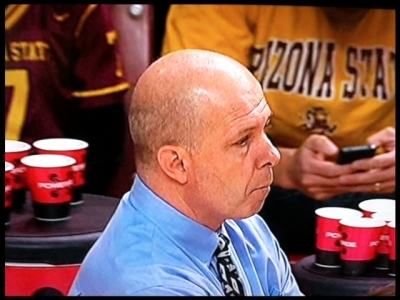 Coach Herb Sendek and the Sun Devils lost to Stanford at home, 62-59. The lackluster shooting for ASU was consistent throughout the contest. Whether it was on 3 point attempts, put back layups, or free throws, there seemed to be a lid covering the basket for the Sun Devils. Even a few Carrick Felix 3 pointers that did go in rolled around the rim a few times before deciding to drop. Sharp shooter Jonathan Gilling finished the day (3-8) from behind the arc, and the rest of the team didn’t do much better (7-23 / 30.4%). As much as the Devils rely on the long ball, those numbers didn’t add up on Saturday. On the other hand, Stanford made 55.6% of their shots from 3 point land (10-18). Felix had a solid game with 16 points and 10 rebounds, Jahii Carson had 15 points and Gilling finished with 13. Those were the only real production numbers worth reporting. Evan Gordon and Jordan Bachynski both had an off day, which is a sure way to crack the formula that has been successful for ASU basketball. In addition, free throws continue to be a problem for ASU and it was only a matter of time before it ended up costing them a game. It happened on Saturday. The Sun Devils made only half of their attempts and finished 8-16 from the line (50%). In a game with no room for error, that compounded the problems for the team. Even with the poor shooting performance, ASU actually had a chance to tie the game at the end with a 3 pointer. As the last shot took flight, you could have almost predicted the result…off the rim, no good. It was just that kind of day for the Sun Devils. Next up, the Sun Devils hit the road to play Utah on Wednesday, February 13th.